SLPRB AP Police Syllabus 2016 : Andhra Pradesh State Level Police Recruitment Board has released notification for 492 SCT Constable post. This Board will conduct PET & PMT Exam in first week of October, 2016.The Final Written Examination is likely to be held in the first week of November, 2016. Those applicant who are appearing in AP Police Constable Examination can check syllabus from here. SLPRB AP Police Syllabus is available here. Candidate can check below. State Level Police Recruitment Board, Andhra Pradesh : Andhra Pradesh State Level Police Recruitment Board was established in 1985. AP Police Department is committed to delivering the most efficient, productive and quality police service to the community. Andhra Police Department is an Open , Friendly and Community minded organization devoted to quality public service service. Popular as : SLPRB, A.P. Andhra Pradesh AP Police Recruitment 2016 : State Level Police Recruitment Board of Andhra Pradesh has published recruitment notification for filling up 494 post of Stipendiary Cadet Trainee (SCT) Police Constable in Civil/ AR Police Department. Advertisement has released on 27.08.2016. Application will be start from 07.09.2016. Candidate can check more information about AP Police Constable Recruitment 2016 from here. This Board will held Final Written Examination for SCT Constable post. Those candidate who will appearing in AP Police Constable Exam 2016 after completion of application process can check AP Police Constable Syllabus from here. Physical Measurements Test (PMT) : The Physical Standards are mentioned at Para- 11above. All candidates who meet the required standards will be declared as qualified. Physical Efficiency Test (PET) : All candidates declared qualified as above shall be required to attend 1600 Meters run (1 Mile Run) which is qualifying. AP SLPRB Final Exam Syllabus/ Pattern : AP Police Communication Constable Exam pattern is provided here. The Technical Paper contains the questions on Technical subjects such as Electrical, Electronics & Radio, Basics of Computers and Telephone System. The final written examination will be of one paper for 200 marks. It will be Objective type Technical paper. The total time duration is 03 (three) hours. Characteristics and Application of conductors. Wire wound (linear logarithmic) resistors. The principle of construction and special feature of the simple meter. Function and application of vibrators. Characteristics and Application of inductance in a tuned circuit. Coil-Concept of reactance, phase, power factor, Inductance and coefficient of coupling. Series and parallel connection of capacitor in A.C circuits. Different types of capacitors and their application. Basic elements of the resonance circuit. The principle of FET transistors. Uses of diodes as rectifiers. Half wave and Full wave rectifier circuit. Carrier modulation (AM and FM) Single side band. Bandwidth, Fidelity and quality construction in the receiver. The range of Audio and quality construction in the receiver. The range of Audio Frequency. The principle of a superheterodyne receiver. The principle of Magnetic sound recording. Magnetic heads are erasing head. Construction and working principle of Picture tube Deflection camera tube. Basic T.V. System scanning synchronisation composite video signal. PC assembly and software installation. Andhra Pradesh Police Constable (Communications) Exam Pattern 2016 – 17 : Andhra Police Recruitment Board has released exam scheme for selection of Constable Vacancy. First of all the department will conduct PET & PMT Exam for Constable Vacancy. Those candidates who are shortlisted after Physical Exam will called for Written Exam (Technical Exam). The written exam will contain 200 Marks. After that the merit list will prepares of Selected candidates. Candidates should download Admit Card for AP Police Constable Syllabus from official website. For future updates about Exam Date & Releasing of Admit card, You can also check from here. The Syllabus for State Level Police Recruitment Board, Andhra Pradesh is given discipline wise. Candidates must download the SLPRB AP Police Syllabus & Exam Pattern. First of all candidates, open AP Police official site : www.appolice.gov.in. Click to Syllabi link given left side on homepage. Detail of Andhra Police syllabus 2016, opening in pdf format online. You can check your subject exam pattern, syllabus, scheme etc. Candidate should also download here for branch wise syllabus. Download Andhra Pradesh SCT Police Syllabus. More details For AP Police Official Notification 2016. 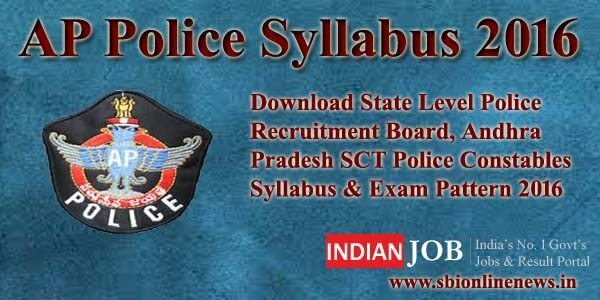 SLPRB AP Police Syllabus 2016 : State Level Police Recruitment Board, Andhra Pradesh is going to conduct the exam for 494 SCT Police Constables (Communications). Candidates can check Andhra Pradesh Stipendiary Cadet Trainee Police Constables Exam Syllabus, Test Pattern, Exam Dates here.